Eight local young trailblazers have been selected to take part in the Western Bulldogs Leadership Program for 2019. Supported by Ararat Rural City Council and Central Grampians LLEN, the program aims to give future leaders from the municipality a chance to hone their skills and gain experience in all facets of leadership. A nomination process ran through February and March, with Jack Cameron, Sam Cairns, Ebony Hannemann, Holly McAdie, Max Willmott, Maia Ratana, Marcus Graham and Joshua Atkinson being selected for the program. Ararat Rural City Council CEO Dr Tim Harrison said the nine young people were welcomed on board at an orientation evening last Thursday, with participants heading off to Lady Northcote Camp in Glenmore for their first activity on the weekend. “The camp begins an intensive six-month program where the young people will learn about leadership, teamwork, communication, goal setting and resilience,” Dr Harrison said. Western Bulldogs Youth Development Coordinator Salim Mohamed said the club is excited to work with the group. “They were a little bit shy at first but as the program develops it will be amazing to see how they grow,” he said. Central Grampians LLEN CEO Ray Campling said his organisation was really happy to be part of the program as co-sponsor this year. “We are also really excited to see how these eight young people grow as they learn new skills and develop their leadership potential,” Mr Campling said. 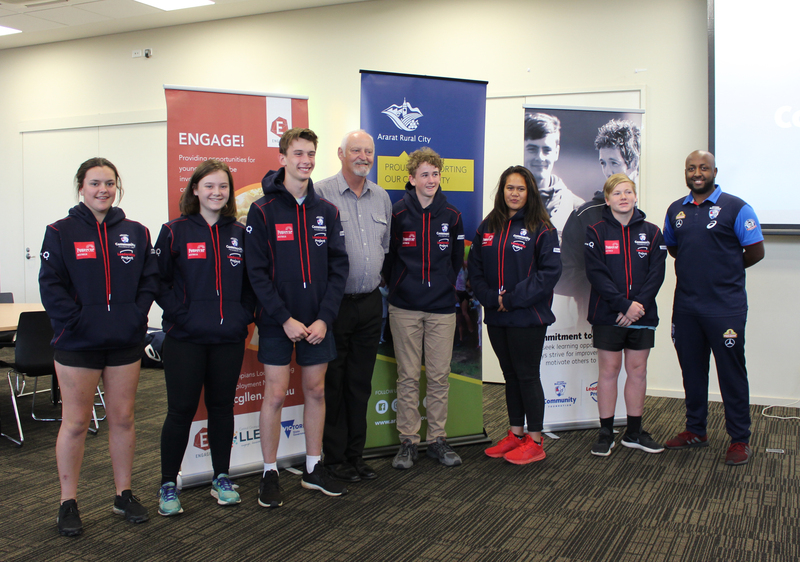 The leadership program, aimed at 14 to 16-year-olds, has run in the region for two years and is an initiative of the Western Bulldogs Community Foundation. As part of the program, participants attend two camps, six workshops, and a careers expo, and will also undertake a community project and present to Ararat Rural City Council in September.